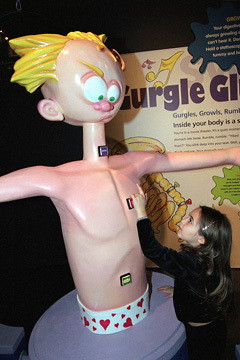 All things yucky are explored in "Grossology: The Impolite Science of the Human Body," now on exhibit at Bishop Museum. There's an audience for everything. There's even an audience fascinated with bodily functions rarely talked about in polite company. For those not too highbrow to admit to it, topics such as vomiting, burping and spitting hold a strange appeal for some people -- namely small children and one adult named Sylvia Branzei-Velasquez. "The Impolite Science of the Human Body"
» Place: Bishop Museum, Castle Memorial Building, 1525 Bernice St.
» Note: This weekend's Family Sunday will be devoted to "Grossology." From 9 a.m. to 5 p.m., there will be prize giveaways, contests, activities and planetarium shows. Entry fee for kamaaina and military is $3. » The average person swallows about one quart of mucous daily. » Humans inhale through one nostril at a time, breathing in one nostril for about four hours at a time before switching sides. » Fresh urine is more sanitary than saliva. Healthy, freshly produced urine does not contain bacteria. As Branzei-Velasquez might say to that, "cool." All things slimy, gassy, or just plain gross ooze into Bishop Museum Saturday as part of "Grossology: The Impolite Science of the Human Body." 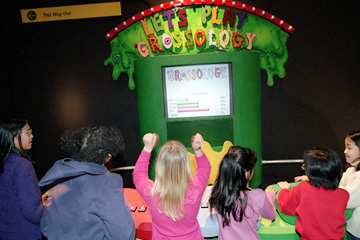 The interactive exhibit is based upon the author's first educational-tool book, "Grossology." 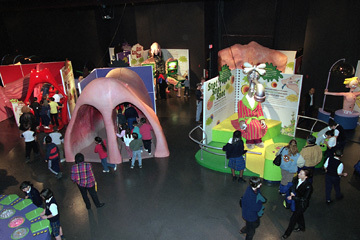 Children -- or adults -- can pick at, prod or just primly read about various functions of the human body, particularly of the nastiest sort, in the 6,000 square-foot exhibit. There's buttons to push, digestive systems to crawl through, and a burping pinball machine to toy with. "I wanted people to see where I'm coming from," said Branzei-Velasquez. Perhaps a visitor might even walk away retaining a statistic or two. Very cool, indeed. The exhibit has traveled through North America as part of a five-year museum and science center tour, and the international exhibit has also grossed out thrilled kids in Singapore, England and France. There are sounds, motions and smells of the pungent kind, all intended to stir one's senses and make an enthusiastic young viewer giggle with delight. 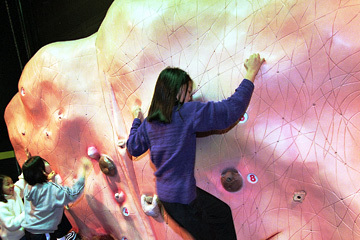 Fun factoids are driven home by 20 interactive displays and activities such as the walk-in nose and the human skin wall covered with hair, wounds, warts and all. Or there's the vomit center and the 30-foot long, 3-D digestive system display. There's also the nine-foot tall faucet named Nigel who explains the million-and-one reasons why noses drip, made all the more posh-sounding in a British accent. "The little, little ones -- those under 5 -- really like Nigel a lot," said Branzei-Velasquez by phone from her home in Pointe Robert, Wash. "They'll push his button over and over just to hear him talk. But kids watch other people -- they want to know why you stink, the armpit smells, there are fart smells ..."
Displays with motion, sounds and smells teach kids about the body. THE SOFT-SPOKEN, rather polite, former science teacher has not only wrote "Grossology," but subsequent books "Animal Grossology," "Grossology Begins At Home," "Hands-On Grossology" and "Grossology And You." Branzei-Velasquez said that though the youngest may have a superficial interest in topics deemed unspeakable, they also need realistic answers to their queries. The book series is a mix of imaginative illustrations by Jack Keely and obscure factoids Branzei-Velasquez researched during her years as a science teacher in Mendocino, Calif. The former grade and middle-school teacher received a Bachelor of Science degree in microbiology and a Masters of Arts in science education from the University of Michigan. The books and exhibit have reached its target audience of 6- to 14-year-olds and their science teachers. An estimated 500,000 copies of "Grossology" have been sold since its publication 10 years ago. The book has been printed in French, Korean, Japanese and Bulgarian, in addition to English. There will also be an animated TV show based upon the book, set to air this fall on Discovery Kids. The show will be also be a detective series based upon two children who solve mysteries like "snot crimes." So what was the inspiration behind "Grossology"? "I was clipping my toenails one afternoon, and I had an epiphany -- this is really gross stuff," said Branzei-Velasquez of her first manuscript. "It was life-changing." The book's manuscript was originally snatched up by Planet Dexter publishers. Not surprisingly, "Grossology" was first marketed toward radio shock jocks. "It was kind of upsetting," she said. "(Public relations) would focus on the gross side, the rude jokes. But, being a teacher, I wanted to focus on real facts. I hope when kids pick up the book, they'll walk away learning to care for their bodies." 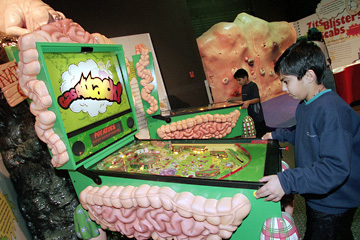 The interactive "Grossology" has traveled the globe, entertaining and educating youngsters in such places as Singapore, England and France. The exhibit has also traveled through North America as part of a five-year museum and science center tour.